Nineteenth century landscape architect Adolph Strauch, trained in Vienna, designed the Spring Grove Cemetery in Cincinnati according to the new park cemetery style. After Strauch died in 1883, the Boston nurseryman Charles Mason Hovey made it clear the English garden writer John Claudius Loudon (1783-1843) first encouraged the park cemetery. Then Hovey made it clear that it was Loudon who was the master mind behind the park cemetery concept. 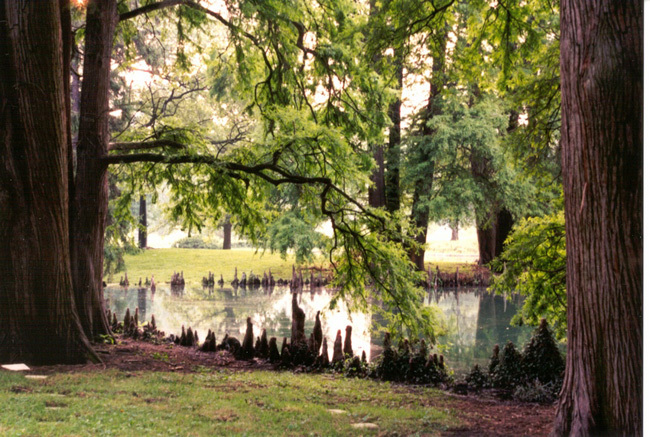 The cypress trees frame this water view in Cincinnati’s Spring Grove Cemetery. Thus Hovey wanted to let American gardeners know that the idea for the park cemetery, as seen also today in cemeteries like Mount Auburn in Cambridge, Mass. and Forest Hills in Boston, originated in England with Loudon.